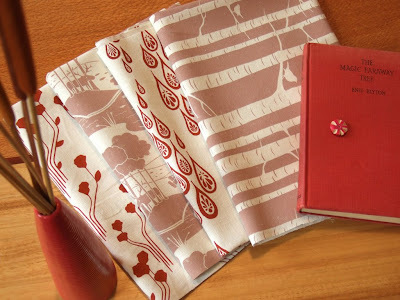 kirin notebook - the blog of lara cameron: New organic eco friendly fabrics! How's that for title full of buzz words. 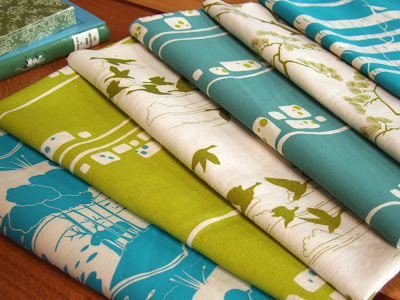 I am so excited to announce that my latest range of fabrics is printed on eco friendly basecloth! The new fabric is a blend of 55% hemp and 45% Certified Organic cotton - whoo! Although it is made from hemp it's actually really soft and lovely - I really like it. Wow, I'll be needing some of that. Love the bright colors! and the eco friendliness is awesome too! now.. if only i had the money.. i'm still reeling in from my last few fabric purchases (yours and the other lovely aussie gals). the money adds up so quickly! and the shipping too! anyhow, will there be any new patterns too? wink wink. My heart skipped a beat when I read the title of this post - your awesome designs on organic fabric; major drool! very cool! i am making a quilt with some of your fabrics right now and i love them! Who needs a nice camera? I'd buy them just from the photos you posted in this entry! hi there, i was wondering where you get your fabric printed and if i could have the contact. I got a print Gocco thinking i would use that to stamp on cloth but that turned out to be quite a feat. Hope to hear from you!! Thanks in advance! the bulokku (hope i spelled that correctly) looks great! love the blue and green. welcome back! I love the look of your new stuff - particularly the birch trees - I had just drawn something similar in a journal project I am taking part in - to mark the edge of my page on conservation work - to be honest now seeing your fabric printed I think I must have seen your fabric and been inspired by it without knowing - I hope you don't mind! The new colors are gorgeous! Maybe this will be my chance to get my hands on some of the patterns I missed last time. Oh wow, oh wow. So exciting! they look GREAT! and nice work on hemp/cotton blend, I've learned a lot about hemp this year and i really like it. The fabric looks awesome! Great new colourways and the basecloth sounds wonderful! The basecloth sounds great too. What a lovely eco-friendly find x. They look beautiful! I'm trying to exercise restraint here and keep to my fabric diet (use from the stash ...) but these might cause me to fall off the wagon! Very envious about your eco-friendly fabric! I can't seem to find something affordable in South Africa, but congrats on making such a fab change to an already amazing product! Yeah, i am agreed with this article. I think all the colors are Gorgeous. I love the look of your new stuff - particularly the birch trees - I had just drawn something similar in a journal project I am taking part in - to mark the edge of my page on conservation work - to be honest now seeing your fabric printed I think I must have seen your fabric and been inspired by it without knowing - I hope you don't mind! Great post i look forward to reading more.